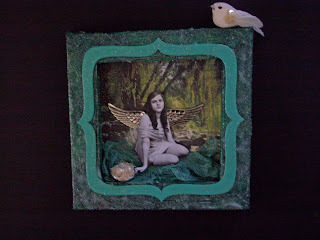 After I made the fairy reverse canvas (see in a previous post), I decided that maybe she really needed to stay with me. So, I made another. I needed to step out of my comfort zone, and use colours that I rarely do. So, this one is made using green as the predominant colour. I used Golden Glass Bead Gel over the outside of the frame and then sprayed lightly with silver to give it a sparkle. The nest is from my favourite 'E' store, Wednesday Wishes. It is so tiny, but, just perfect for this project. Another beautiful piece of art Lucy! Thank you girls for your comments, I am chuffed! Love this fairy and this is my favourite colour! Your artwork is terrific. Cheers!